Luxuriously and Soft – Soft like silk or cashmere. You will LOVE the way it feels! Highly Absorbent – Moisture wicking keeps you dry. Bamboo is 300% more absorbent than cotton. It can take almost a 1/3 pound of synthetic fertilizers to grow just one pound of raw cotton in the US. Choose organic! It’s better for you, your baby, and the planet! 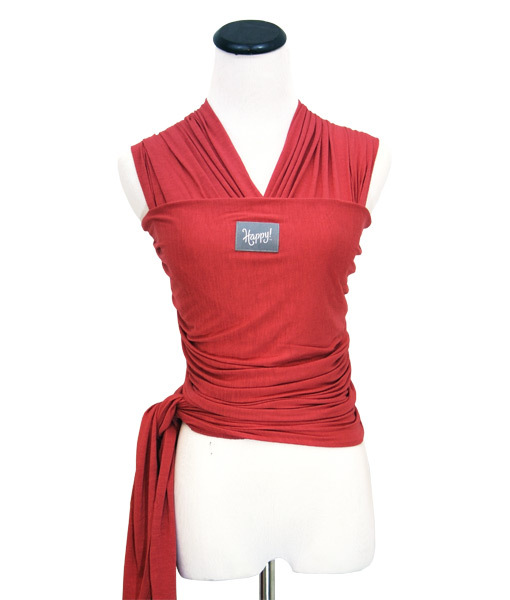 1 Unfold your baby wrap and begin with the Happy Wrap logo centered above your navel. 2 Take the ends around your waist. Bring one end up and over your shoulder. 3 Bring the other piece over your opposite shoulder. This will form an “X” over your back. 4 Tuck both pieces under the label section. 5 Pull down to tighten. Cross the pieces to form an “X” high on your chest. The higher the “X” the higher your baby will sit. 6 Bring the ends behind your back. If there is enough fabric, continue around to the front. 7 Tie a double knot in the front, on your hip, or behind your back. 8 You are now ready to wear your baby. Please proceed to either the Newborn Hold or Hug Hold instructions. 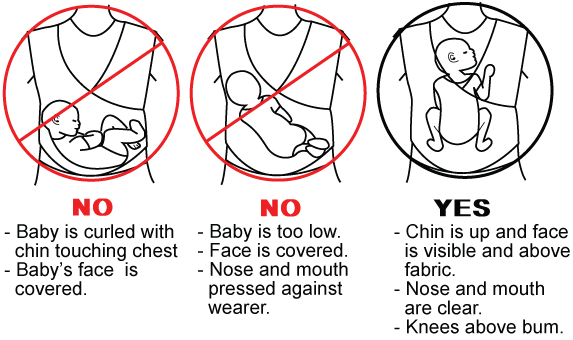 4 Perform a safety check and enjoy wearing your baby! 1 Locate the shoulder piece that is closest to your chest and pull away from your body. 2 While securely holding your baby, bring baby’s first leg through the opening and spread the fabric over baby’s bottom, back, and shoulder. 3 Bring baby’s second leg through the other shoulder piece and spread the fabric over baby’s bottom, back, and shoulder. 4 Spread the fabric wide to the hollow of your baby’s knees to ensure a comfortable sitting position. 5 Gently bring your baby’s legs through the logo section. 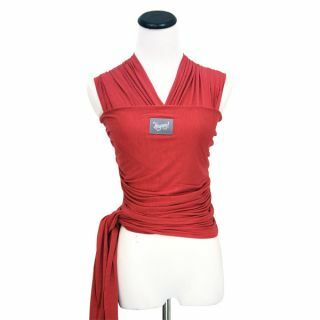 6 Pull the logo section over your baby’s bottom and up to the back of your baby’s neck. 7 Perform a safety check and enjoy wearing your baby! 1 Lower the Happy Wrap logo section below baby’s bottom. 2 Carefully support your baby as you open the shoulder piece. 3 Use both hands to securely hold your baby. Newborns will need additional head support. 4 Carefully and gently lift your baby up and out, keeping your baby close as you lift. 1. Make sure that baby is positioned correctly in the baby wrap. Your baby can suffocate if positioned incorrectly. Premature babies or those with respiratory problems or illness and babies under 4 months are at greatest risk for suffocation. 2. Check on your baby often and ensure that baby is breathing at all times. Never allow the baby to be carried in such a way that his chin is curled against his chest. Newborns lack the muscle control to open their airways when placed in this position. The chin should be in a neutral or slightly higher position. 3. Baby’s face should be visible at all times. Never cover your baby’s head and face with fabric. 4. Always carry your baby in an upright vertical position. Do not use this wrap for a back carry. 5. Never place your baby in a forward position in the wrap. 6. Never place more than one baby in the wrap at a time. 7. 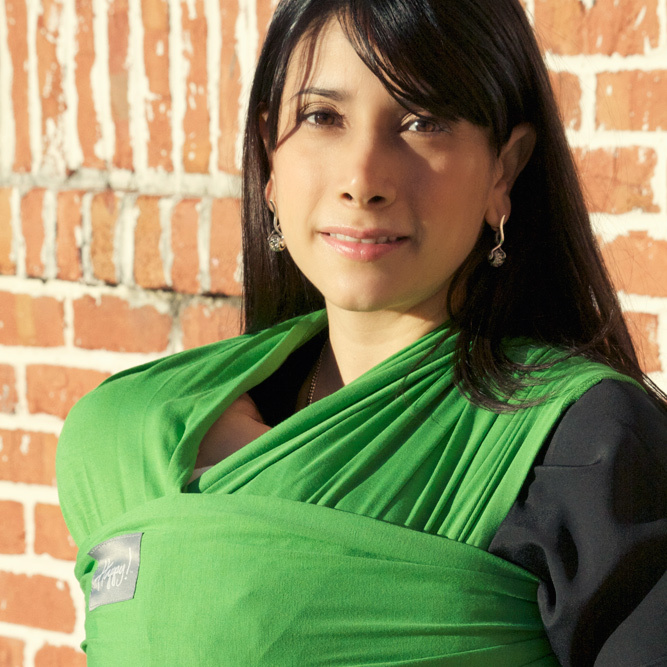 Baby wraps allow parents to be hands free to do other things, but use caution during movement. Using a baby wrap affects your center of balance and leaning, bending over, or tripping can cause the baby to fall. Keep a hand on your baby while moving and whenever possible bend from your knees. 8. Do not use the baby wrap while engaging in activities that involve excessive movement such as running or jumping or other activities with similar bouncing and shaking motions. These motions can be damaging to a baby’s developing neck, spine and brain. 9. The Happy Wrap is not a substitute for a safety seat. Never use the baby wrap in a moving vehicle or while riding a bike. 10. Inspect the condition of the baby wrap before each use. Do not use a baby wrap unless it is sound. 11. Never place loose objects in the wrap with your baby that could be a choking hazard, obstruct baby’s breathing, or otherwise hurt your baby. Also, be aware of what your baby can reach when in the wrap. 12. Do not use the baby wrap in any body of water. 13. Ensure that your baby is protected from the elements. Baby’s head, arms, and legs may need extra protection from the sun. Don’t dress your baby too warmly in the summer and avoid activities in which the baby could overheat. Likewise, be sure your baby does not get too cold in the winter. There are many coats and ponchos designed for use with baby wraps. 14. Be cautious when consuming hot foods and beverages while the baby is in the wrap as these could burn the baby. Do not use the wrap while cooking or near hot surfaces. You are responsible for the safety of your baby when he or she is in the baby wrap. Please use common sense and your best judgement to ensure that your baby is safe and secure.